The SpaceX Falcon 9 rocket soars into space from Space Launch Complex-40 on Cape Canaveral Air Force Station in Florida at 3:44 a.m. EDT on May 22, 2012, carrying the Dragon capsule to orbit. CAPE CANAVERAL, Fla. — Private spaceflight supporters saw a major validation today (May 22) with the successful launch of the first commercial vehicle to visit the International Space Station. 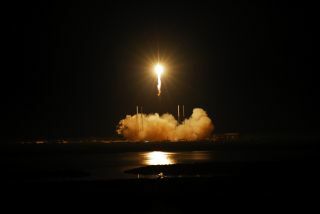 The unmanned Dragon capsule, built by the commercial firm Space Exploration Technologies Corp. (SpaceX), lifted off atop the company's Falcon 9 rocket at 3:44 a.m. EDT (0744 GMT) from a pad here at the Cape Canaveral Air Force Station. "I think we're really at the dawn of a new era for space exploration and one where there's a much bigger role for commercial companies," SpaceX founder and chief designer Elon Musk said during a news briefing following the launch. Musk, a billionaire entrepreneur, watched over the flight from SpaceX's mission control center at its Hawthorne, Calif., headquarters. The flawless pre-dawn launch came after SpaceX officials called off a first try on Saturday (May 19) because of an engine glitch. The SpaceX team was able to investigate and repair the problem over the weekend, and try again successfully three days later. Dragon is due to rendezvous with the space station on Thursday (May 24); the next day, astronauts inside the outpost plan to grab onto the capsule with the station's robotic arm and berth it to the laboratory. SpaceX's first space station-bound Dragon spacecraft, flying atop a Falcon 9 rocket, launches behind a high fidelity mockup of the space shuttle, NASA's previous means of delivering cargo to International Space Station. Liftoff occurred on May 22, 2012 from Cape Canaveral Air Force Station. The mission is the final test flight for the Dragon capsule before it can start delivering cargo to the space station. SpaceX is contracted to fly at least 12 delivery missions over the next few years for a total of $1.6 billion. NASA hopes private vehicles can take over the job of flying supplies, and eventually astronauts, to low-Earth orbit, to allow the agency to pursue manned missions to places people have never gone before. "It demonstrates what we said was the future of American space exploration, and it's actually using private industry to provide for access to low-Earth orbit while NASA goes off and does what NASA does best, and that's exploring, doing things that private industry cannot do, or should not do," NASA administrator Charles Bolden told SPACE.com after the liftoff. "Taking the risks in things like sending humans to an asteroid, to Mars, to other places in our solar system." However the plan has been criticized by some, including members of Congress, who question the safety and reliability of commercial vehicles. "I hope that the success of this mission thus far will dispel some of the doubts that people have," Musk said. "I do think in some cases people had legitimate concerns because there's no precedent for what we're doing here. We've had three successes of Falcon 9, two successful flights of Dragon, and hopefully we'll have a successful berthing at the space station. I think this should dispel the doubts of anyone if they're reasonable." "Every launch into space is a thrilling event, but this one is especially exciting because it represents the potential of a new era in American spaceflight," White House science advisor John Holdren said in a statement. "Partnering with U.S. companies such as SpaceX to provide cargo and eventually crew service to the International Space Station is a cornerstone of the President’s plan for maintaining America’s leadership in space."